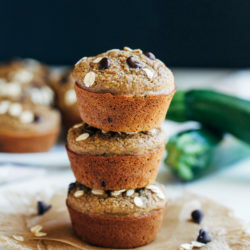 Healthy Flourless Zucchini Muffins- super easy to make and there’s only one dish to wash, your blender! They’re so moist and fluffy, no one will ever know they’re made with healthy ingredients! It was in February! 5 months is a lifetime on the muffin scale. Of all things to bring them back with, I thought zucchini would be the most fitting. 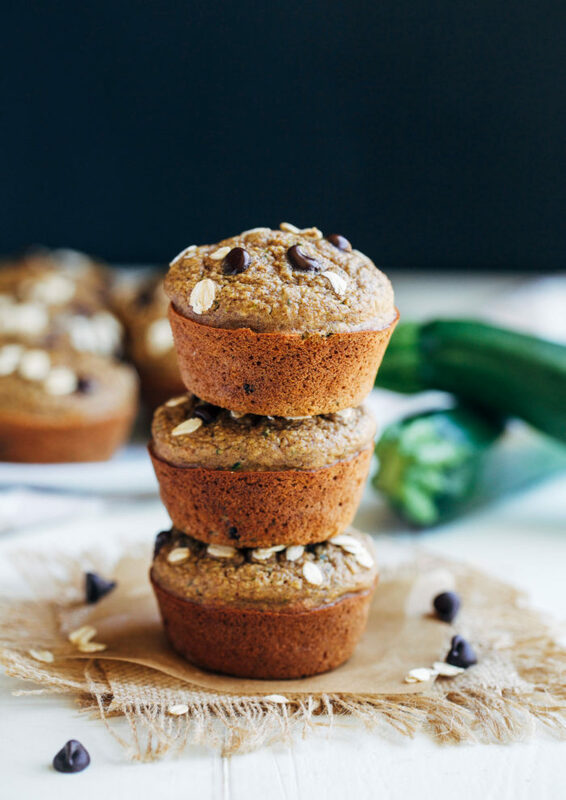 Summertime is all about the zucchini and I can’t think of a better way to eat it then hidden inside a soft fluffy muffin. Can you? If you guys remember the last muffin recipe, I mentioned having difficulty with them shrinking thanks to the wonderful complications of baking chemistry. Well the same thing happened the first time I tried to make these and I figured out that the applesauce is the culprit. Hence the reason why you see applesauce in the next photograph but not the finalized ingredient list. Something about the acids in the applesauce keep a reaction from taking place that causes the muffins to stay fluffy once they’re baked. Basically. So I tried subbing in non-dairy yogurt instead and the problem was instantly solved. Phew! 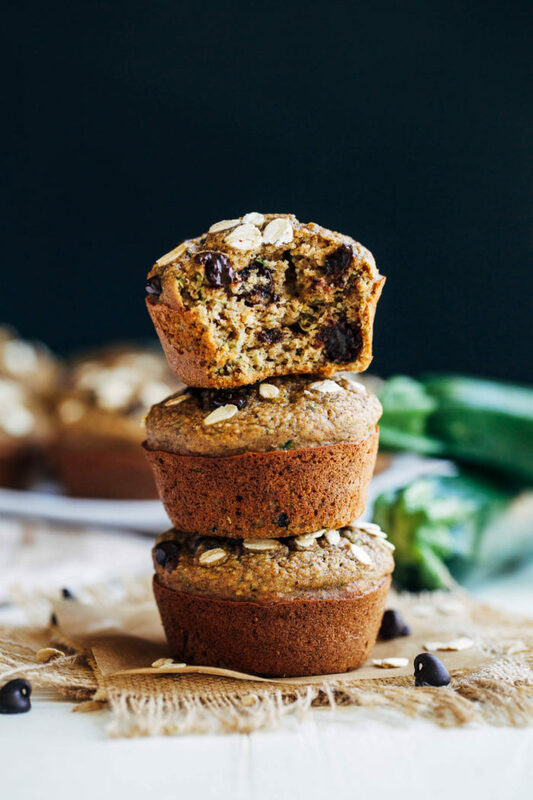 These are just as easy to make as the rest of my flourless blender muffin recipes. It takes all of ten minutes to throw everything into the blender and then add a little shredded zucchini. You don’t even have to blot it with a paper towel. 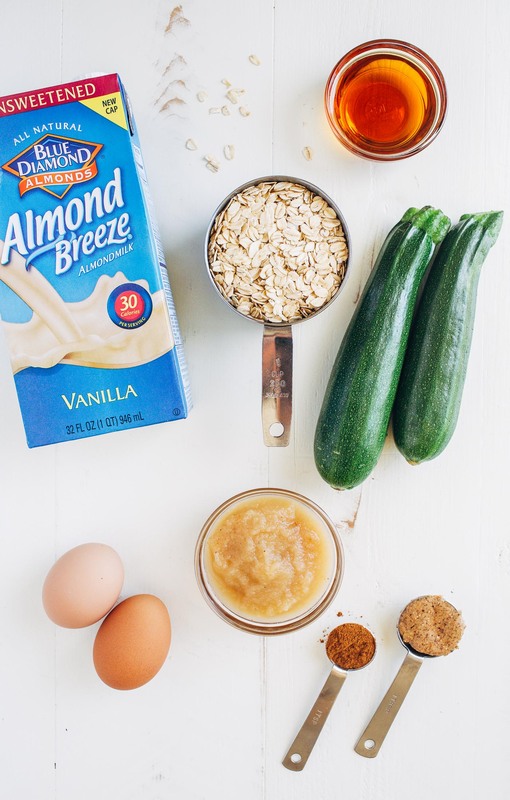 I created this recipe in partnership with my friends over at Almond Breeze, who are the official almondmilk of Team USA Volleyball this year. They asked me to share something that will help you “Serve up Your Best” and I’m a firm believer that these muffins will do that. They’re my favorite thing to whip up for grab-n-go snacks or breakfasts during the week. I always feel satisfied and energized after I eat one. There’s no crash and burn like there is with their white flour, refined sugar counterpart. I’m continually amazed at how good they turn out considering the wholesome ingredient list. 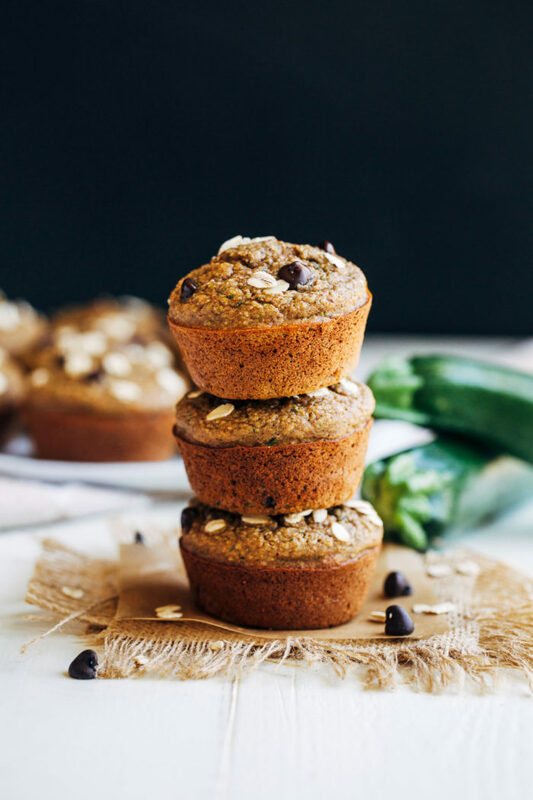 If you haven’t tried my flourless muffins yet, these are a great place to start. I guarantee everyone will love them! Preheat the oven to 350°F then grease or line a muffin tin for 12 muffins and set aside. 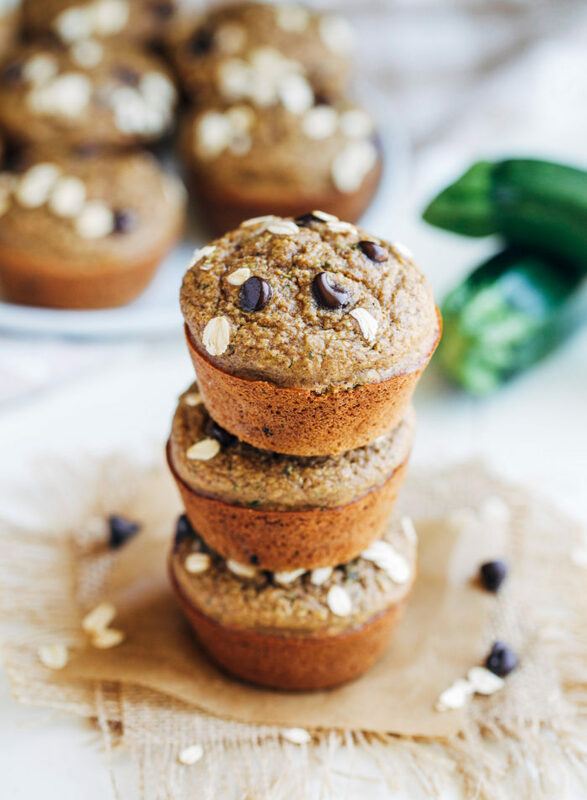 In a blender or a food processor, layer the wet ingredients first (almond milk to almond butter), then the oats and remaining dry ingredients (baking powder to ginger) on top. Blend on high for about 20 seconds, until smooth. 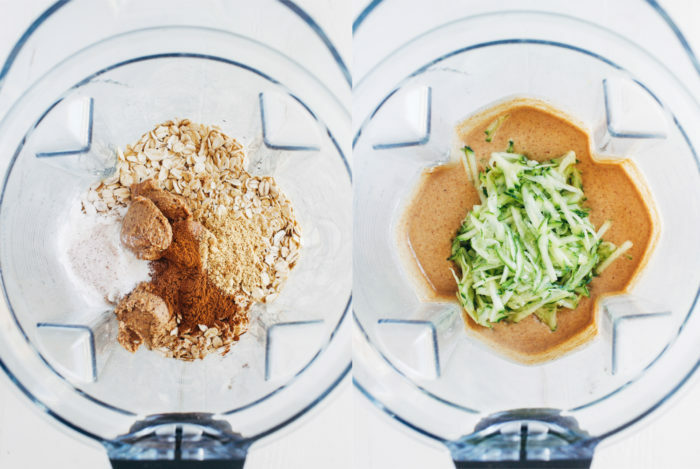 Add the shredded zucchini then pulse a few times until evenly distributed in the batter. Lastly, add the chocolate chips and use a spoon to stir them in by hand. Pour the batter into the muffin tin so that each is filled approximately 3/4 of the way full. Sprinkle with rolled oats and a few more chocolate chips then bake in the oven for 20 minutes, until light golden brown. Allow to cool for at least 15 minutes before digging in. Leftovers can be stored in an airtight container in the refrigerator for up to 3 days. This post was created in partnership with Blue Diamond Almond Breeze Almondmilk. Almond Breeze believes in the best. That’s why they only use Blue Diamond Almonds to make their almondmilk and are proud to be an official sponsor of USA Volleyball. Visitwww.ServeUpYourBest.com for a chance to win $5,000 for the ultimate beach day, learn fun volleyball moves, get Almond Breeze coupons and smoothie recipes!